The George see The King William IV and the Umfreville page. Queen Anne see the Umfreville page. Queens Head see the Umfreville page. Red Lyon see the Umfreville page. The Amato Pub c 1910. It is is probable that there has been an inn on this site for over 300 years. The Hare and Hounds (previously known as The Rummer) in Chalk Lane was renamed the Amato shortly after the 1838 Epsom Derby, which was won by Amato ridden by J Chapple and trained by Ralph Sherwood. This thirty to one outsider was born and bred in Epsom. It had never raced before nor after winning the Derby and is buried in the grounds of The Durdans where its owner Sir Gilbert Heathcote lived. There is a local tradition that the name of the Derby winner is chalked onto the pub's well on the morning of the race. This is believed to be a gipsy tradition which dates back decades and the prediction is said to come true three times out of four. The old Amato Inn was destroyed by fire in the early hours of Thursday 20 April 1922. In the newspaper report the building was alleged to have been over three hundred years old. One of the inn-keeper's daughters raised the alarm when she heard crackling of wood and detected smoke. She woke Mr and Mrs Palmer, plus two other children and a lady visitor, and they all managed to escape wearing only their night clothes. The stair well was already full of smoke and within minutes the flames had reached their bedrooms. Mr Palmer's son was unable to get out of the yard the usual way, so he threw his bicycle over the wall, climbed after it and pedaled to the police station to raise the alarm. Epsom Fire Brigade was alerted at five past four in the morning and arrived in less than 10 minutes. They increased the water pressure in the fire hoses by using a motor pump and were able to save the adjoining buildings but it was too late for the inn. The bar was already burnt out and the wooden structure was alight. The outside walls were too hot for the firemen to use a ladder against them. Fortunately it was a calm night and they were able to prevent the fire from reaching the adjoining stables. The Palmers were cared for by neighbours who provided clothing and refreshment to the grateful family. The fire brigade was at the scene until 11 o'clock and by great good fortune were able to retrieve the bar's takings from race day which Mr Palmer had stored in one of the bedrooms for safe keeping. The damage was estimated at being between £300 and £600 and unfortunately Mr Palmer had only partially insured the building. The cause of the fire was believed to have been a cigarette dropped in the sawdust on the bar floor at closing time. Sources: Epsom Advertiser 21 Apr 1922. Copyright image courtesy of Liz Manterfield 2007. In 1914 the Brick Kiln was a detached, two storey, brick building. It had been partly rebuilt in 1901 at a cost of £800. It was double fronted extending for 59 feet. The upper part of the building was covered with rough cast, and it had a slate roof. There was a Public Bar and a private bar, plus a club room, a tap room and a bar parlour. In the basement there was a cellar. It had a combined kitchen and scullery. On the first floor there were 5 bedrooms with a landing, and a WC. Outside there was another WC, and stabling for two horses and a coach house. 1914 Inland Revenue survey James Blake Occupier. Owned by Messrs ACS and H Crowley. 1924,1927,1930 Kelly's directory James Blake. Beer Retailer. Pub not named. 1938 Kelly's Directory Henry Maggs. Brick Kiln. The Eclipse public house in West Hill was named after one of Epsom's most famous racehorses. He first ran in 1769 (before the Derby had been instituted) and in that year won all eight races in which he participated. In 1770 he was entered in nine races and won three, being unopposed in the other six. Eclipse was then retired to stud. It is said that Eclipse can be found in the pedigree line of about 80% of today's racehorses. The former Eclipse public house is now used as offices. Copyright image courtesy of Liz Manterfield 2006. The Nonsuch Antiquarian Society Occasional Paper 15 on Ewell Public Houses notes that in a document dated 1787 the property was described as "A messuage with brewhouse, garden and stables, known as the Eight Bells, formerly two tenements occupied by John Griffin, Victualler." The building in existence today was rebuilt in 1905. It was very well built in brick and partly tile hung. It had a main bar with a quarter size billiard room off it.there was also a Club Room. There was sitting room and a combined kitchen and scullery. There was a urinal and a modern WC. Upstairs there were 5 bed and box rooms.The cellars were not very deep with very low ceilings. At the rear there were gardens and another WC. In front of the pub were four adjoining cottages that were very dilapidated, with some dilapidated stabling. There were 2 loose boxes and a coach house with a loft above it. In 1914 it belonged to Gage and Overton's Brewery limited and later belonged to Charringtons. It was bought by Greene King in 1992. An article in the Ewell Parish News Feb 1973 suggested that it was named "The Eight Bells" after the bells in the church tower'. But, as Bourne Hall Museum pointed out, there were only six bells, not eight at St Mary's in 1787. However, eight bells make a complete peel so perhaps some licence was used rather than admit that St Mary's was two bells short of a peel. Eight Bells is certainly a traditional pub name, perhaps intended to attract custom from ringers. [ ] Probable match but not proved. Epsom & Ewell Local And Family History Centre Collection (Opens in a new window). 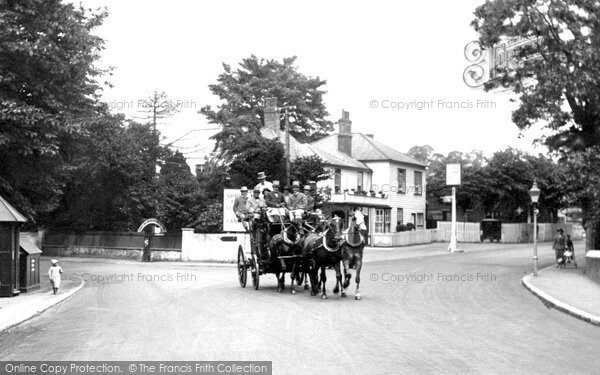 This pub was built in 1854 as the Railway Arms (or the Railway Hotel), opposite the approach to Ewell East station. It was built on land owned by Sir George Lewen Glyn so not surprisingly the name changed to the Glyn Arms. In the For Sale advertisement in the Times 23 June 1863 it was described as "a very cheerful and attractive country inn, the Glyn Arms Hotel, opposite the railway station in Ewell. Built about 10 years ago, it is admirably arranged for the principal purposes of business and home requirements." The lease had 90years to run and the ground rent was £10. It was a brick and cemented, square building with a slate roof. In 1914 there was a large bar and a coffee room and Club room. It had a drawing room and 3 bedrooms on the first floor and four attics on the second floor. It was in a poor state of repair inside and out, and the inspector noted that it needed money spending on it at once. Outside was a round yard with a coach house and a 3 stall loose box, a skittle alley, a low urinal with a garden and tennis lawn. After a short spell in 1991 as TJ's Rib Place it has now become Toby's Carvery. 1860 advert in Times 1861 Pub name not given. Epsom & Ewell Local And Family History Centre Collection(Opens in a new window). Formerly the Green Man. In 1914 the Green Man was a part timber and brick building with a roof of tiles and slate. It had a wide frontage of 85 feet. Inside there was a bar, a bagatelle room, a tap room and a sitting room with a door to the garden. There was a small bar parlour, a kitchen and a scullery. Upstairs there were four bedrooms and a club room, and there were cellars in the basement. Outside there was an outhouse, a brick and slated stable with four stalls and a coach house with a loft over it. The current building was erected in 1930s, but an inn of this name is mentioned in the Parish Overseer's accounts and Vestry Minutes of 1763. For many years the pub was owned by Hodgson, the Kingston upon Thames brewer. OS ref TQ 218 634. The original pub had a large half-moon pull-in with a horses' water trough at one end. In 1914 it was described as a detached brick and slate building. It contained a bar,tap room, living room, scullery, wash house and WC, with an outside urinal. There was a cellar in the basement. Upstairs there wre four bedrooms and a dressing room. Outside there was an old timber and tiled shed which had once been a stable for four horses. The site was 35 poles in size.It was well used by carmen stopping for a break in their journeys. The freehold was owned by Hodgson's Kingston Brewery Company. The pub was rebuilt c 1950, and owned by Courage. Demolished 2001/2002. 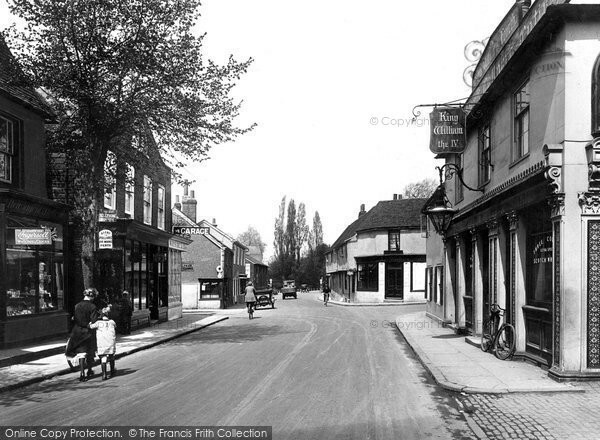 This photograph taken around 1950 shows the old pub being demolished and the new pub being built. Inland Revenue Valuation 1914 Robert Morris on a yearly tenancy. The Ladas, in Woodcote Road at the junction with Chalk Lane is named after the 1894 Derby winner. Ladas was ridden by J Watts and owned by Lord Rosebery, the then Prime Minister. One of Lord Rosebery's homes was the Durdans, which he had purchased from the Heathcote family Ladas had won all his previous races and won at 9-2 on; he never raced again. A motion to suspend the sitting of Parliament for the day of the Derby had been defeated! There was a beer house in this location in the first half of the nineteenth century, when it was a small cottage style building, as shown in the photograph. It was rebuilt around 1905 in brick building with the upper part hung with vertical tiles and the lower part clad with rough cast. The roof was tiled. Inside were private and public bars, a tap room and a tea room. There was kitchen, a pantry, a scullery, a larder, a WC and a cellar underneath. Upstairs there were 5 bedrooms and a club room. Outside there was a yard with two WCs and a urinal, a coal store, an old large timber pan tiled shed and brick stabling or garage with a loft over it and a slate roof. It had gas, and water main drainage. This building was pulled down to make way for a redevelopment of shops and Barclays Bank in 1963. 1861 census Beerhouse and Cow Keeper, no pub name. There has been a public house on this site since at least 1839 when it was recorded in Pigots Directory. The building there in 1914 was described as a lathe, plaster and timber building with a slate roof. There was a brick addition with a slated roof that served as a tap room. Inside there were four bedrooms, a sitting room, kitchen, bar, bar, parlour scullery. Outside there was shed, WC, timber stable with a slate roof and loft, a coach house and 3 stalls and 2 further sheds. The present building was erected in 1932. Horse racing on the Downs no doubt started as a simple race between friends on horseback galloping between two points over the open terrain, jumping hedges and ditches on their way. By Pepys' time (1660s) there were regular noonday races. These developed into a series of heats over a four-mile, straight course between Carshalton and Epsom Downs. Between heats the horses were rubbed down at a wooden shed. By 1801 ale and other refreshments were being sold at the shed. The original building is believed to have dated from the 1750s but on 3 June 1857 the pub, outbuildings and stabling caught fire and were destroyed. In 1863 grandiose plans were drawn up to build a hotel on the site, but at an estimated cost of £80,000- four times the cost of the Grand Stand built thirty three years earlier - it was unaffordable and a more modest plan was adopted. The new building was called the Downs Hotel and this name continued until the 1960s when the name was changed back to "The Rubbing House" thus recalling its origins. By 2003 the Rubbing House had become shabby and dilapidated, and the owners applied for permission to refurbish and extend the property to include a restaurant but in the same style as the original. The refurbishment was completed in 2004. The glass panels with etchings of race horses and the iron railings on the balcony have been preserved from the earlier building and help to preserve the original atmosphere. Copyright images courtesy of Liz Manterfield 2007. 1938 Kelly's directory Mrs Caroline Meadows. King William IV , colloquially known the King Bill in the 1920s (Bourne Hall Museum (BHM) file: Pocock). The current building is early nineteenth century but there are records of an earlier pub on the site called the George 1757 ( BHM: NOR 10/171/12 Oct and also in, A Companion from London to Brighthelmstone by John Edwards, 1801). It presumably changed its name to King William IV sometime in the 1830s in recognition of the new sovereign. The name was lost in 1997 when the pub reopened as The Friend and Firkin, part of the Firkin policy of changing pub names. It has now reverted to King William IV. King William IV, High Street, Ewell 2006. The present pub was built between the wars and replaced an earlier building. The entrance to the pub was in an unmade lane off Chessington Road, and customers were directed to it by a sign on the main road. The lane was later made up to become Plough Road. Note the pub sign on right indicating the way to the pub. George Turk ran into some difficulties in 1917 when he applied to renew his licence for the Plough, which he was running at the time as a beerhouse. It was opposed at the February meeting of the Licensing Justices because on 13 June 1916 a number of soldiers undergoing hospital treatment had been served with intoxicating liquor contrary to Defence of the Realm regulations and in July a child under 14 was served with liquor in an unsealed vessel. Since the two convictions the police had given special attention to the conduct of the house and had every reason to be satisfied, Mr Turk. The Police Inspector had known Turk for over 9 years although he had only been at the Plough for two, and considered him to be of the highest character. The brewers, Swan Brewery of Leatherhead, said they were satisfied with the way Turk had conducted the pub. They had sent out a circular in September 1915 and drawn attention to the military restriction in serving liquor to men serving his Majesty. The licence was renewed. (Epsom Advertiser 3 Mar 1917). Parts of this building date from the eighteenth century. It was originally a farmhouse before becoming an inn, probably early in the nineteenth century. It is named after the Long Spring that rises near by. It was substantially refurbished in 2005. John Hobson son hotel manager. In 1934 brewers Hanbury and Buxton applied to the magistrates for a licence for a public house in Stoneleigh. They pointed out that there were now 2000 houses within half a mile of the station and had aerial photos taken at various stages in the construction of the suburb. This move was supported by the newly-formed Stoneleigh Residents' Association. Finally the magistrates agreed that there was a need for a social focal point in the area and work began on the south side of the Broadway. In November 1935 the Stoneleigh Hotel was completed. The building was built in mock-Tudor style and was classed as a superb example of the kind. The large function room is decorated after the style of a room in Hampton Court Palace. In 2002 following refurbishment, this room was dedicated to the late Peter Denney, Secretary of Stoneleigh Residents' Association for over 40 years and a much loved local character. Owners Hanbury and Buxton later became Trumans and in more recent times ownership changed to John Barras. An earlier building nearby was also called The Organ 1762 (Bourne Hall Museum file: Pubs) but faced directly onto London road. In 1914 it was described as a timber building, old but recently done up. It had a bar, 6 pull engines with fittings. There were steps up to the Billiard Room. There was a sitting room at the rear. There was a cellar below and 6 bedrooms upstairs. Outside there were 2 WCs and a urinal. There was also a timber and tiled stable with four stalls, and a coach house. At that time it was owned by Halder and Collyers Brewery Co. According to the Ewell Parish News Feb. 1973 the name is said to have been given when Henry Willis built the church organ. "Father Willis's" men had the habit of walking up to what was then a small inn on the London Road during their mid-day dinner break. Unfortunately the dates don't match, since the church organ was built in 1865. "Organs" is more common among earlier forms of the name, suggesting that it may have been a transferred field-name. The name was lost in 1998, when the pub reopened as Jim Thompson's. Copyright image courtesy of Peter Reed 2006. The existing building was rebuilt and re-oriented in the 1930s when the Ewell By-Pass was built. This image has been digitally retouched in places. A pub is believed to have stood on this site opposite the Hogs Mill River since 1456, and in the early part of the nineteenth century it was known as King William IV, not to be confused with the King William IV in the High Street. The current building dates from 1858. In 1914 it was described as having cellars with a good floor, 2 large and 3 small bedrooms, a bar with fittings, a sitting room, kitchen and scullery. Outside were urinals and a WC, a good yard with a timber and pan tiled coach house and stables. It had gas, water and mains drainage. It has fine leaded Isleworth Brewery windows. 1851 census Elizabeth Lipscomb Kingston rd, William 4 beer shop (sic) West Hambledon, Hampshire.